London. Astoria Theatre, Finsbury Park. 1960. A young, white, Suffolk teenager sits, front row circle, with a 20 year-old ‘chaperoning’ mate, having somehow wangled a couple of tickets from the promoters of Ray Charles’s first ever London gig before they even went on sale. Two white sore thumbs in a sea of black. Eventually a familiar figure in dark glasses but with extraordinary, marionette-like jerky movements, head tilted back flashing a dazzling smile towards the roof not the audience, is led onto the stage by a helper no bigger than a beer truck. Absolute silence. Small rituals of preparation are performed at the piano. The air thick with tension as if a thunderstorm loomed. About 2,000 people seemed to be holding their breath. 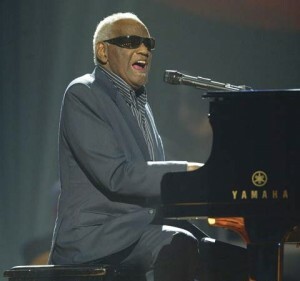 And then with one note and a rooted, blues drenched moan, Mr Ray Charles let the cork out. Two hours later, the audience, sweating, swaying, screaming and thunderously pounding the floor watch as the beer truck takes again the hand of this quite extraordinary, frail-looking performer who has just entranced them for two exhilarating hours of blues, jazz, rock, country and a few nameless musical forms in between. Exhausted the audience slump back in their seats, having throughout dispensed with the convention of waiting to the end for standing ovations. Yes, maybe even genius. As you see, with Ray this reviewer is both biased and hard to please. Happy to report that this powerful, moving film serves its subject well. Conventional biopic in structure, Hackforth breaks up the inevitable episodic form effectively by using flashback for Charles’s traumatic childhood – the brother drowned in a washtub and the 3-year journey at 4 from sight to darkness. All the usual biopic conventions follow: getting to play, getting recognized, getting screwed, and screwing back. And just as we don’t own cats, they own us; so with talent – a force that drives its possessor to see just how close he can get to the fire. Music, therefore drugs. Axiomatic. Still a quite extraordinary story of an immensely gifted eclectic popular musician that touches on personal tragedy, race, politics and friendship. But it is the music that lifts Ray the film out of sight; just as it lifted the sightless Ray Charles out of soul-destroying black Georgia poverty. Plugging in to the ethnic cross -over explosion of rock ‘n’ roll, Charles still retained strong elements of authentic blues and the cool edge of jazz until eventually wandering around the musical landscape as the mood and his promiscuous musical talent took him. Jaimie Foxx as Charles, borders on the eerily good. Oscar stuff. The rest of the performances are also very good indeed and apart from one totally misconceived and unnecessary scene at the end, Hackforth keeps the action and the music driving forward comfortably, literally without a jarring note. There may be a some judicious rounding of awkward historical corners, I don’t know, but this is certainly Ray Charles with at least some warts ‘n all. But it is the music that grabs you by the throat and the heart. It is Ray Charles himself you hear, for he and his music are the soul of the film. As the celebration of the life of a fine musician and extraordinary man, Ray has the unexpected poignancy of becoming a memorial, with Charles’s death in 2004 before release. However after 15 years of trying to get it to the screen, Hackforth has done him proud.